When headed off to college for the first time, there’s nothing more exciting and scary than getting your very first dorm room. Moving away from home, meeting and making new friends, even possibly sharing your living space with a roommate; all of these things can make a huge impact on your college life. But, the unfortunate truth is that most college freshman don’t have a huge budget for anything beyond school supplies and basic necessities. So, the question becomes, how can you decorate your new living quarters on a budget? It may sound small, but doing something as simple as changing the arrangement of the current furniture can have a huge impact on the room. Dorm furniture is usually pretty sparse, so moving things into a non-standard layout can both mix things up and create a unique flair and unexpected space. For example, try pushing beds against the walls instead of sticking into the middle of the room to make extra floor space. Dorm rooms aren’t known for their space. One of the best ways to overcome this deficiency is to make sure that nothing in your living area is just one thing. The back sides of doors make great storage spaces as do the spaces below beds. Companies like DormCo specialize in making the most of all the space in your dorm closet with items like hangers and shelf liners. For additional storage in the corner or under the bed, Dorm Trunks has a variety of trunks that can provide storage, security and—with a little design and creativity—additional seating. Nothing is more boring that white walls, bare windows and plain floors. Consider mixing things up with a unique rug from Dorm Rugs. Add posters, pictures or easy-to-remove wallpaper to cover plain walls. Or, pick up custom blinds from The Shade Store to add add a personal flair to your windows. These also can provide lighting control and privacy for you and any possible roommates. Finding little ways to personalize your living space can add some style while continuously re-energizing you as you face the everyday struggles of college life. Custom bulletin boards from The Container Store can be regularly updated with your dreams and goals or pictures from home to keep you focused when times get difficult. And, for that additional little touch, consider putting a message board on the outside of your door for fun communication with all of your neighbors. Lighting can make a huge difference on the personality of your dorm and doesn’t have to take a bite out of your wallet. Using Christmas lanterns and lights can highlight various wall decorations or add a unique flair to your ceiling and furniture. Plus, companies like IKEA have a huge selection of inexpensive lamps to fit every style and room decoration. Whatever you do, keep it uniquely you. You are going to be living in this space, so make sure it is somewhere you want to go at the end of the day. About the Author: Stephen Collins was born in Phoenix, Arizona and has spent most of his life in the Southwestern United States, playing among the cowboys and aliens. This admitted lover of sci-fi and fantasy developed a passion for the written word early in life and began writing at a young age, mostly for the thrill and joy of the experience. He is currently working on his second book while continuing to weave his wordsmithing magic as a freelance writer. Heading off to college? Give yourself the gift of good grades with The Secrets of Top Students! It’s no surprise that college students are one of the largest customer bases for storage facilities everywhere. As an undergrad, the roof over your head is temporary at best (assuming you’re not living at home). It’s not uncommon to be in a different building every year, and since you’re only in classes for nine months out of the year there is an awkward hiatus where you don’t know what to do with your stuff in between moves (and sometimes even when you’re settled, space can be a precious commodity). Storage units are great way to keep your stuff safe and near campus during the summer months, but it pays to know what you’re getting into. Storage unit facilities offer different sizes, but a typical one will have a range of units to choose from. The smallest are called “lockers” and are typically about 5’x5’. As a college student, you’ll most likely want to lease a 5’x5’, 5’x10’, or 10’x10’ at the max. Here is a breakdown of what you can expect to fit in these units, so you can better plan your storage needs. 5’x5’: The “locker” size should be more than enough room for someone living in a shared dorm, or even a single dorm. Since dorms typically provide furniture like beds, desks, chairs, and dressers, you shouldn’t have many large items. Get creative and think of it like a game of Tetris, and you’ll be surprised by what you can fit this small unit. 5’x10’: If you have any furniture, bikes, or other larger pieces then you’ll probably want to look at this larger size. Move in the larger items first, then stack your smaller stuff around it if you want to maximize the potential of the space. 10’x10’: By the time you’re a junior you’ll be surprised how many things you’ve managed to accumulate. 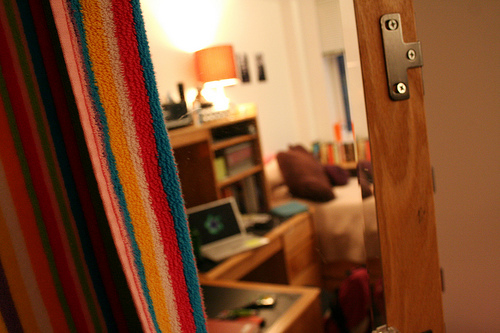 Upperclassmen tend to leave the dorms and live in student apartments or houses. A 10’x10’ unit should fit all of your furniture and items, providing you haven’t bought any major appliances. Blah, blah, blah, (insert overused broke college student joke here). Everyone knows college students have little to no money, and while “discount storage units” are never a good idea, there are still some ways to save money. Other than looking out for promotional offers from facilities throughout the year, your best bet is to find some friends and split the cost of a unit. If you follow this route, make sure that you go in with people you can trust and that the facility allows multiple names on the lease, or figure out who will be responsible for the lease. Also be sure that everyone has a copy of the key. Some facilities offer electronic or cylinder locks with the units. These are the best available, but most of the time you are required to provide your own lock. It is tempting to spend $5 and throw on a cheap combination lock, but you get what you pay for when it comes to security and these are easily broken or picked. Your best bet is to purchase a disc lock. These are very hard to cut or break and they offer pick resistant tumblers. As mentioned above, if you are sharing a unit make sure that everyone who needs a key has one! Storage units are a great way to keep your stuff organized and safe while you leave campus for the summer, and they can be affordable when you team up with friends. Jenn Young is freelance writer working with Uncle Bob’s. She is passionate about beautifying her home and she currently writes on anything and everything related to storage and organization!